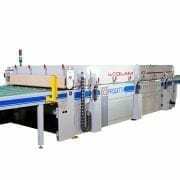 Ecolam 10 is the flagship of the solar laminators produced by Ecoprogetti. 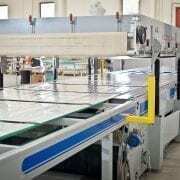 It has all the latest technology available to obtain the best lamination process ever. Usable lamination area 5400 x 2050 mm divided in 5 plates. Each plate is divided in 3 controllable zones. Each zone is heated by electrical elements with an uniformity of +/- 2 C°. The temperatures in each zone are independent to an guarantee uniform gel content over the complete surface of the module. Automatic release sheet in Teflon on both module sides in lamination. The laminator has a quick change system of the silicone membrane with clamps around the external borders of the laminator which makes it possible to change the membrane in less than 30 minutes and the change can be performed with the plates in working temperature. Long life of the membrane guaranteed (Min.3000 Cycle).